It’s been quiet on the show front lately but we will be back with a bang on Wednesday for the RHS Flower Show at Tatton Park. This time, the star of the show will be the Hungry Bin and a few hundred resident worms. Worm composting and gardening go hand in hand, and gardeners rave about the effect of worm tea. So come and talk to our experts about the wormery…we promise you won’t have to give the worms a hand shake! The RHS Flower Show runs from 18th to 22nd of July and it is a fantastic show to visit. You’ll find gorgeous show gardens, spectacular floral displays and homegrown fruit and veg galore, as well as loads of stalls bursting with goodies for you to buy. Buy your tickets in advance and save £5 per person! We hope to see you there! All this rain may be frustrating but it does give you the perfect excuse to curl up on the sofa, have a cuppa and relax with a wordsearch. 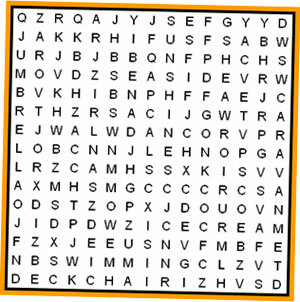 And if you complete this wordsearch correctly, you might just win yourself a brilliant prize too! Solve our (ironically) themed summer wordsearch email an image of the solution to stephanie@omlet.co.uk by midnight on Thursday 19th July for your chance to win. The prize is a £30 voucher to spend on any of the fabulous items on the online shop… a rain cover for the Eglu perhaps!? Good cluck! Words: Fishandchips, icecream, deckchair, sunshine, barbeque, seaside, picnic, swimming, caravan, camping, showers, umbrella. 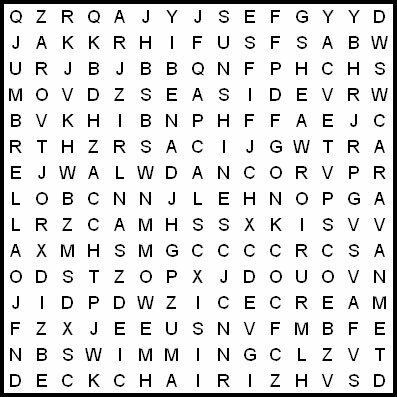 Click on the wordsearch to see it full-size! Have you heard of Compostwoman? Environmental Educator, Forest School Leader, Holistic Therapist, Community Veg Growing Advisor and Master Composter, this woman knows all there is to know about gardening…and she’s supposed to be retired! Compostwoman certainly doesn’t put here feet up – when she’s not composting, growing fruit and veg, or volunteering, she’ll usually be writing her poplar blog The Compost Bin. So we couldn’t think of anyone more perfect to test out our latest composter, the Hungry Bin. Compostwoman set up her Hungry Bin last Friday and it took her less than 10 minutes to build. A few days later she reported on the latest goings on in the new Worm Composter. Due to the rain the worms had been moved to the top of the Hungry Bin, but the lid had contained them. She had been concerned that the Worm Tea collection tray would have filled with rain water, but the design had kept it sheltered. She also reported that the worms were ‘busily working away’ so ‘they must be happy in their environment’. So far, so good with the Hungry Bin trial, and you can keep updated by reading The Compost Bin blog! How would you like to get your hands on a free Hungry Bin? The Guardian are giving away a Hungry Bin Super Starter Pack, worth £225, to one lucky person. It’s easy to enter, you just need to answer one simple question on their Gardening Blog website, but you’d better get a wriggle on, because the competition closes at midnight tomorrow. The Super Starter Pack includes the Hungry Bin Worm Composter, worm composting guide, 500g of composting worms and 30 litres of worm bedding.All you need to add is your food waste!